After Cecilia Kerche went out of business, her pointe shoe collection was taken over by the SoDanca Company. 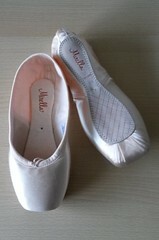 The old Cecilia Kerche, or CK pointe shoe line had a few models that were updated and improved. One of those models, the Kitri, was given a slight design overhaul. 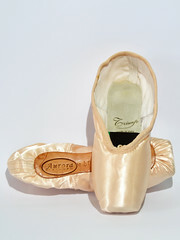 Even though the Kitri pointe shoe model is described as suitable for square shaped feet, the newer version of the Kitri actually has a more tapered box than it used to have. Although the new Kitri is still designed for dancers who have a big toe and second toe that are equal in length, the box shape was changed to a lower profile. Reviews on the Kitri pointe shoe are varied. Because the Kitri model is low cut on the sides and heel, some dancers find themselves struggling to keep the shoe on during class. Other dancers enjoy the aesthetics of a low cut shoe and claim that the Kitri really enhances the arch of the foot. 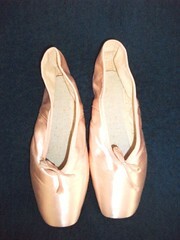 Because the Kitri is a professional pointe shoe, the standard shank is a 3/4 shank. This shank is made of synthetic materials that bounce back into shape. The opinions about the medium-soft shank are also varied. Some dancers love the flexibility, and other dancers don’t find the shanks supportive enough. The Kitri pointe shoes are described as pre-arched and made with a very tough satin-like fabric that doesn’t wear as quickly as other shoes. The Kitri is made with Brazilian paste. I have had my own experiences with Brazilian paste shoes and all I can say is that it takes a good bit of time to wear out the box. 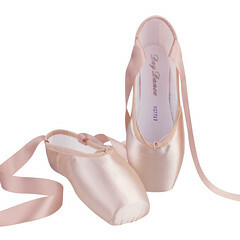 The Kitri model is well suited for dancers who have strong feet and don’t have to rely on hard shanks while on pointe. The best characteristics of the Kitri are flexibility and strength. As you can see in the photo, the Kitri model has one of the longest vamp lengths in the CK Professional Line. 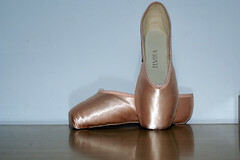 This entry was posted in Pointe Shoe Brands, Spanish Brands and tagged Cecilia Kerche, Cecilia Kerche Kitri, Pointe Shoe Brands, pointe shoe for square feet, Pointe Shoe Images, SoDanca, SoDanca CK Kitri, SoDanca pointe shoes. Bookmark the permalink. 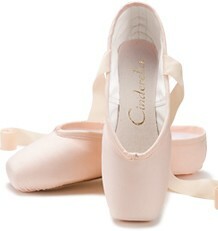 My pointe shoes I have right now are Cecilia Kerche for SoDanca shoes. 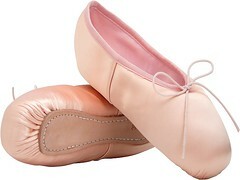 They’re not the Kitri variety but I’m sorry, I have to say, that I really HATE these pointe shoes. Yeah, they’ll probably last forever but thats because the box and shank are harder then a brick. It doesn’t move and it doesn’t conform to my feet. I can’t pointe my toes effectively in these shoes. And there’s an excess of fabric around my foot that bunches up and looks bad. This might be partly the fact that I went to a bad store that I got stuck with a bad pointe shoes but….I wouldn’t recommend ceiclia kerche shoes to anybody. It doesn’t surprise that they went out of business. I had a similar problem with Prima-Soft Gala. 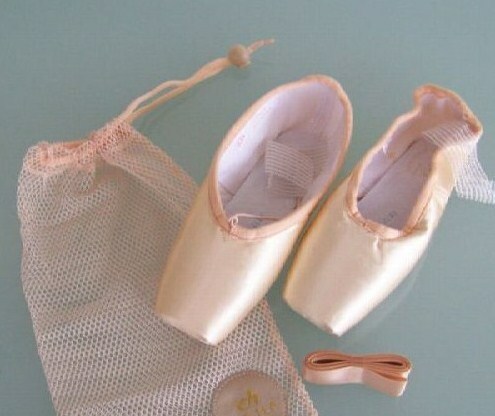 Because the Prima-Soft and SoDanca pointe shoes are made using Brazilian pasting methods,the shoes do come out as hard as a brick and most of them tend to stay that way unfortunately.